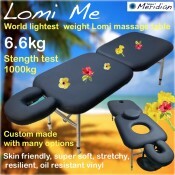 About this Model: One of our world lightest weight portable massage tables models. Extra narrow and ..
About this Model: This model is made the same way as the Compact table - Just lighter in weight. Mad..
About this Model: This model is similar to the Atmosphere 49 - yet shorter by 20cm. Truly compact an..
About this Model: As its name suggests, it's firstly a really compact table...it is so easy and ligh..
About this Model: The 'EasyLift All in One Deluxe' is as it's name. Deluxe! The 75mm thick multipurp..
About this Model: The 'Easy-Lift A.I.O Main' is basically our A.I.O Main fitted with the Easy-Lift l..
About this Model: The KING Lift Up Back build in option has few advantages you won’t find with other.. The "King EasyLift" is our new style extra wide King table with the EasyLift legs included. It is 85..